Personally, no. Goodness no. But why when I go to a Sonic convention I love it! Maybe people are just nicer and less weird in real life? Today we discuss the appeal of Sonic conventions and why people want them so much. We also compare Summer Of Sonic to Sonic Boom and how their approaches differ the experience. 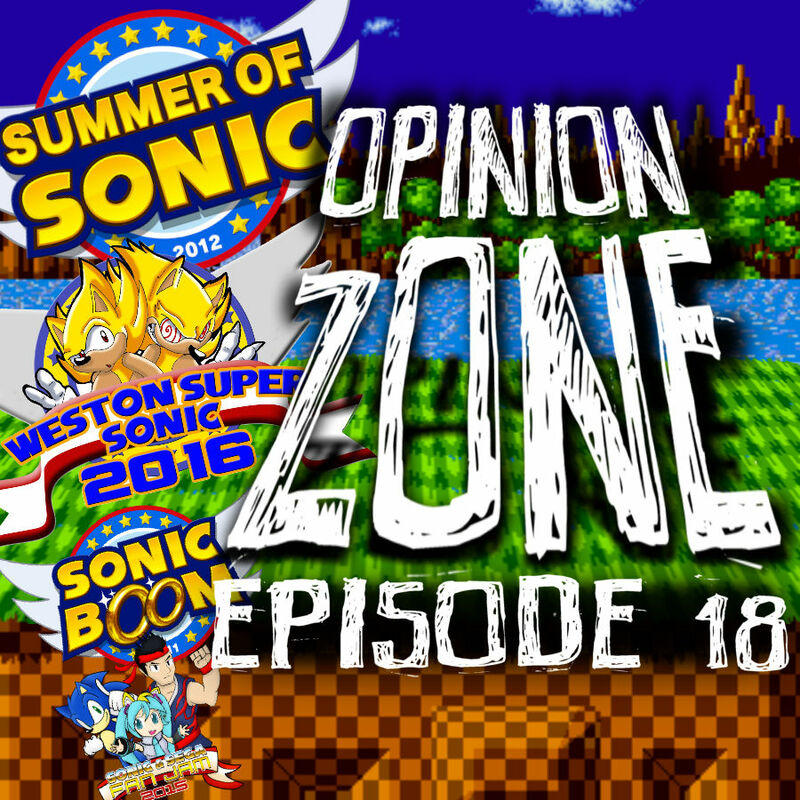 Also if you are a Summer Of Sonic fan, then you will love today’s episode as one of today’s guests, Kevin Eva, shares some behind stories from his years organising the event. The rest of the gang who have worked at SOS also share some secret untold stories from our time working at the events. Well untold until today! Our other guest, Jono D, also tells us a bit out the next big UK Sonic convention coming up. If you haven’t heard about Weston Super Sonic, think of it as the spiritual successor to Summer Of Sonic. It’s back at Weston Super Mare in January so make sure you go to their facebook page and ask how to get your tickets! If that wasn’t enough we also have a third guest, Cat, part of the Last Minute Continue. Listen as she stands back in fear as the world of Defeat Donnie and Ask Uncle Poxxy take place where we discuss if anxiety should stop you from pursuing your dreams! Yeah, let’s interact with people who spend 90% of their time typing on a computer. Say’s the person who uses his work email address when leaving comments, does your boss know you browse TSS when you should be working? Why not? I mean, that’s what happens when you post a comment anywhere anyway. Never been to an actual fan convention, but hey maybe I should give it a go. Seems like I can actually gain a lot more than just collecting StreetPass on my 3DS. If I have spare time, I would look into it! First Sonic convention (multiday, on top of that) goes to Sonic Globalka in Russia, 2005. It’s since disbanded and been replaced by Super Sonic Con. However, credit where credit is due: Summer of Sonic is the event that inspires Sonic Boom, which inspires Sonic Revolution when it moves to St. Louis. I presume the SoS hiatus is what gives rise to the new UK events. I don’t know Fan Jam’s idea that much but I assume it saw the amount of support for independent events so decided to bring one to the southeastern US, which gets neglected by these things. Summer of Sonic was my first ever convention and I had no idea what to expect. I went with a friend and it turned out to be such a good day that we made a point of attending every SoS we could. We only missed one, because I was too slow booking the tickets, but I still took the time off work and we watched the live feed instead. We went to Western Super Sonic in January and we enjoyed it so much that we both backed their Kickstarter to guarantee our tickets for next year. If you’ve never been to a Sonic convention I can highly recomend going as I’ve always found them to have a great atmosphere. Pro tip though, bring plenty of merch money! Um no. On a personal level I’d rather get a savage kick in the nuts then spend any time with any Sonic fan let alone a whole buildings worth of them. After dealing with the “Sonic fans” and their maturity level for plus five years on the net I no longer care much for the Sonic franchise at this point. Maybe I am a meanie, but frankly, after plus five years of having to listen to all the bile that the Sonic fandom can puke out over anyone who has just the tiniest degree of a different opinion about Sonic I have little to no love left for this fandom, especially when said fandom thinks calling for the death of a game producer or a comic cartoonist is a rational response to something they don’t like. And don’t even get me started on how I feel about the now vocal majority of the fandom and its mad drive to revert Sonic back to the 16 bit days again even if doing so drives away all the fans who actually buy the games. This fandom isn’t a joke, it’s a nightmare. You mean like you just did in the comments of my latest article?